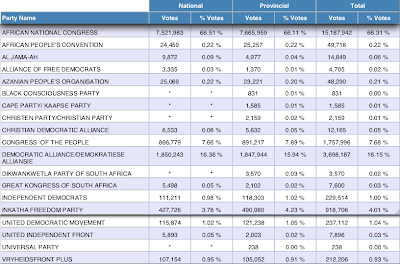 Table from the official IEC website. (click to enlarge) Turnout is very high - over 80% in some provinces. The ANC (top of table) on the edge of that critical 66% needed to change the constitution unilaterally. The old Afrikaaner die-hards (bottom of table) can barely pull 1% of the total vote - of course until 1994 when only people like them could vote their policies were in the electoral majority. It appears 99% of the South African population has moved on. What's the "plus" element of the Vryheidsfront Plus anyway? Even more racist than before! Are they promising Apartheid Plus? It was bad enough as Apartheid Klaasik v.1985 despite what the now disillusioned Ismail Ryklieff (literally a casualty of Apartheid) might confess to Mike McRoberts. TV3's roving Anchor must have watched the notorious "Trojan Horse" massacre on TV as a youth as I did to have made this outrage the central part of his excellent report the other day. I must have been 11 when I watched that on the news and it was something I will never forget. Of all the evil ever televised from Apartheid-era South Africa - pass books, segregation paraphernalia, dogs, necklacing, curfews, sjamboks etc. - the worst was that event. There was an inquest into the incident in March 1988, at which the magistrate ruled that the actions of the police were unreasonable, and the 13 men were found responsible for the deaths. The case was then referred to the Attorney General of the Cape who refused to prosecute. The family of the deceased made South African legal history by launching their own private prosecution. They were however unsuccessful and the thirteen men in question were acquitted in December 1989. Nelson Mandela walked free from prison after more than 27 years inside, just two months later. These scum never served a day. I'm sure Mike must have seen it at the time, and felt the same I do the way he told it, but he's too old school to indulge in any personal story-telling on network news. I find it ironic that South Africa was the only large country in the world to go straight to colour TV without ever having black and white. South Africa Tubemeke in the sidebar. That 66% threshold is a potential problem and allows too much responsibility for any 1 party..the sooner a proper viable opposition emerges (I thought the ANC may lose some support this time around...obviously not) the better. What are the rules on the potential changes to the constitution Tim, do they become issues of conscience or do whips direct the party to support any proposed change? Nelson Mandela walked free from prison after more than 27 years inside, just two months later. These scum never served a day. Thats because of the Truth and Reconciliation Committee. Many in SA knew that unless you forgave and moved on (which makes you a better person than one who wants revenge) then SA would be torn apart. Unpalatable to some, but better than years of civil war, and more bloodshed.